I’m not sure that I can really add to the general response to the movie Aloha (it’s 20% at rottentomatoes.com and I don’t think the box office is of the more optimistic size), but far be it from me not to join in and kick a man while he’s down. About three quarters of the way through the new rom com written and directed by Cameron Crowe (who also gave us the very good Almost Famous, Say Anything and Singles, but not much else since except for, well, Jerry “Show me the money” McGuire, but, no, I’ll stick with not much else since, thanks), I turned to my friend Jim and said, “I’m sorry, but I have to be honest: I have no idea what’s going on here”. Jim laughed and sighed in relief because he had no more of a clue than I did. The plot eventually does make sense; well, within the context of a not particularly well written movie it makes sense, but overall, as a piece of writing, it really makes little sense at all. Aloha is a movie that starts out being about one thing and then halfway through, changes horses in mid-stream and becomes about something totally different. And without the two parts having a clear and logical connection, which is why I suggest it’s a bit hard to follow and understand. 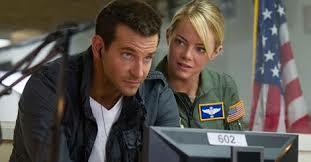 The story begins with the arrival of Brian Gilcrest (Bradley Cooper) to Hawaii. Now, Gilcrest is a damaged soul, someone who is bitter and cynical and in need of some sort of redemption. Well, that’s a good question. We actually only know this because everyone else tells us so. Gilcrest doesn’t say anything that sounds remotely bitter or cynical; he doesn’t act in a way that is remotely bitter or cynical; and Cooper doesn’t act the character (except for a slight limp) in any way that is remotely bitter or cynical. He’s the sort of character whose essential nature would be unknown to us in the audience without the other characters in the movie filling us in and even then, the character doesn’t remotely resemble how everyone describes him. Gilcrest is in Hawaii to convince some political active native Hawaiians to allow them to build a new road to a new army base. At least in the first half. He’s joined in this quest by Allison Ng (Emma Stone) an incredibly (and annoyingly) hyper officer who, because she’s a female in a movie, you know her only real purpose is to fall in love with our hero and help him find redemption because, well, that’s what women do in movies like this. In many ways, Ng is an incredibly insulting character on many levels. She’s one quarter Hawaiian, but like Gilcrest, we only know this because she keeps telling us this over and over and over and over again. Otherwise, we’d have no idea. I suppose I should be grateful that Crowe didn’t use yellowface to make Stone seem more Asian, but still, she is so blonde and so white, that every time she tells us and characters in the movie that she is Asian, you just feel insulted and want to laugh. Even worse, she’s more Catholic than the Catholics. While the other native Hawaiians, the ones who are trying to create an independent Hawaiian state, only pay lip service to the spirituality of the island (they use it as a wedge to get things like cell phone service and land), Ng, this really white, blonde, Caucasian, really believes it. Even more comical is that the native Hawaiians believe that she believes it. Whenever she uses this spiritual background to bond with the locals, you keep expecting them to break out laughing at how ridiculous she is. But no, they take her seriously. No, seriously, they do, they really do. Finally, what nails the coffin shut for this character is when Alec Baldwin’s General Dixon (probably the best performance in the movie) tells Gilcrest that he needs to stay away from Ng because she’s very important to them and they want to keep her. Why? And, again, I’m totally serious here (totally), this is what he says: it’s not because of her skill as an officer and her ability to get the job done; no, it’s because Hillary Clinton likes to see her in the color guard whenever she comes for a visit. Now, at this point, the story shifts gears (and without using a clutch) and becomes some sort of gobbledygook about Bill Murray’s character, Carson Welch, trying to launch a missile into space disguised as a communications satellite and with Gilcrest bringing it down. As far as I could tell, this part of the story never seems remotely believable and doesn’t seem to have anything to do with anything. I do have a theory, though, but it’s only a theory and I can’t remotely back it up and I’m probably wrong. Crowe wrote a movie that was about a bunch of characters who meet in Hawaii over some efforts to get a local political group of native Hawaiians to let them use their land to build a road. But Crowe was told that the stakes just weren’t big enough. So to get the movie done, he had to come up with something really big. Even if it didn’t have anything to do with anything. Now, I’m not saying he actually did this, but it sure feels like that’s what happened. In the end, this is quite possibly the worst movie of the year because it employed so much talent to such terrible ends and even worse, to such obviously terrible ends. So terrible, you keep wondering why someone not only didn’t catch it before it got made, but didn’t take steps to fix it. With Rachel McAdams as Gilcrest’s ex Tracy; John Krasinski as Tracy’s non-talking husband John; and Danny McBride as a colonel who can’t seem to control his fingers. Now, if you want to see a movie that is really about a troubled soul, a man in need of rescuing of some sort, who is really hurt and is search for some sort of redemption or way back, who really does need that balm in Gilead, and a movie in which we don’t have to be told this, but we know almost from the very beginning that something is wrong, I highly recommend the movie Love & Mercy, the new biopic of singer/songwriter Brian Wilson, of The Beach Boys. The movie begins in the 1980’s when Wilson, wanting a new car, goes to a dealership and meets Melinda Ledbetter, a salesperson. There is immediate chemistry, but there is something wrong with Wilson, something a little odd, especially in his relationship with his therapist, Eugene Landy, who seems to have a great deal of control over him (one of the clues that something’s rotten here is that Wilson keeps telling us how free he is, over and over again, and so much does he do this, we know that he’s not). As Ledbetter becomes more involved with Wilson and the two fall in love, she realizes that Landry has manipulated Wilson so that he has a tyrannical control over the singer. So Ledbetter takes it upon herself to try to do something about the situation. Meanwhile, in flashbacks filmed in a more cinema verite style, we learn about the younger Brian Wilson, especially at the time he wanted to try to create a different type of music than just surfing tunes and was experimenting with the way songs were written and recorded. During this period we see some of the causes of what led to his later deterioration: a father who both physically and psychologically abused him (including a damaging hit to the ear); the financial failure of an album full of artistic innovation; his beginning to become paranoid and hear voices; and an LSD trip that may have exacerbated his mental issues. The result is the infamous period of his life where he took to his bed and pretty much never left it for more than three years. And so the suspense grows: will Wilson be able to take control of his situation and will Ledbetter help him back to life, or will Landy and Wilson’s past destroy what little is left of him. And the suspense is often the edge of seat kind. The screenplay, by Oren Moverman (who has given us such solid, interesting and strong work as The Messenger, Rampart and I’m Not There) and Michael A. Lerner, is deeply moving, a rich, emotional and vibrant study of someone who is beset on one side by serious emotional issues and on the other by people who don’t have his best interest at heart. The direction is by Bill Pohlad, better known as a producer on such films as 12 Years a Slave, Into the Wild and Brokeback Mountain. He shows a very strong control over the story telling, filming two different stories in two different styles. How you ultimately feel about the film may depend to some degree on how you feel about the actors. John Cusack is powerful as Wilson, though I did think along the way that I can’t tell if he doesn’t remotely resemble Wilson because he doesn’t or because, come to think of it, I really have no idea what Wilson looks like. 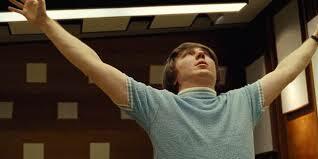 Paul Dano plays the younger Wilson and this is where the movie didn’t always work for me as well as I might like. Dano is just not an actor I connect with; it’s nobody’s fault, or if it is, it’s mine, but I just don’t warm up to him. Elizabeth Banks is Ledbetter and she gives a solid, fine performance. If anything, the issue may be that she’s so beautiful, it sort of dazzles you and may get in the way of the drama at times.